Racist comments may be sadly commonplace online, but you wouldn't expect to see them generated by your co-worker's friends on a picture of your own child. That's the situation Sydney Shelton, an employee of Atlanta's Polaris Marketing Group, found herself in after a colleague posted a selfie with Shelton's 3-year-old son, Cayden. The photo, originally posted Sept. 16, seemed innocent enough, until it began eliciting a string of racist jokes from friends of the photographer. "But Massuh, I dindu nuffin," wrote one commenter on the post. "I didn't know you were a slave owner," said another. 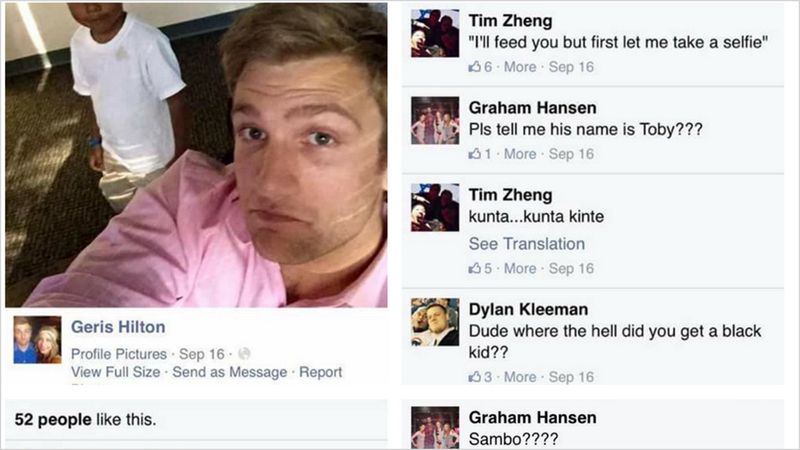 Instead of deleting the comments, the man who posted the image (identified as account manager Gerod Roth, though he posted the photo under the name "Geris Hilton") appeared to join in the jokes, responding "he was feral" to a friend's question, "Dude where the hell did you get a black kid?" The photo and its comments soon went viral after screenshots began being circulated outside the photographer's social network. The hashtag #HisNameIsCayden was created in solidarity with the boy's mother, and today it was one of the top trending topics on Facebook. Roth told Atlanta news station Fox 5 that he's paying a price for comments made by his friends and that he originally posted the photo after Cayden asked him for a selfie. He said his "feral" comment wasn't meant to be racist and that when Facebook removed the post, it also deleted Roth's follow-up comment asking friends to be more respectful and professional. "My entire post was taken out of context," he told the station. "I just feel really upset, not only with myself, but also with the character that was based off the comments that my friends had made. I feel as if not only poor Cayden himself has been victimized but also myself for being targeted." It breaks my heart that Sydney and her adorable son Cayden were subjected to such hateful, ignorant and despicable behavior. Cayden visits my office almost every afternoon after daycare, he's sat at my dinner table and I consider him a part of the PMG family. The swift move generated a large number of positive comments for the agency, such as: "When my business is big enough to need marketing advice, Polaris will be the first place I visit. Thank you for standing up for what's right." "So that means you have a position open," noted another commenter. "To whom do I send my resume?"